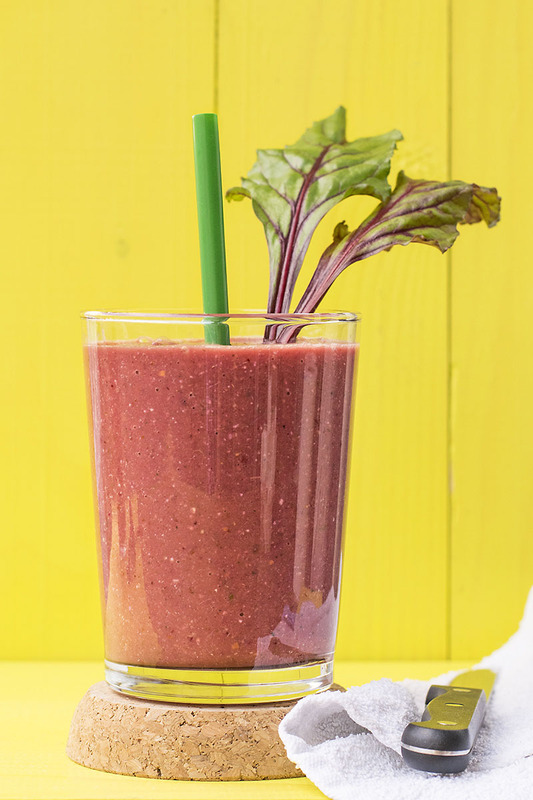 This delicious beet greens detox smoothie with fruits and superfoods will help you cleanse your body and get back on the right track! 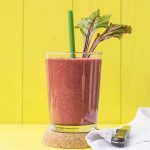 I usually drink this beet greens and superfoods detox smoothie for breakfast, or if I don’t have the time I make it the night before, store it in the fridge, and take it with me at the office the next morning. It goes without saying that you can also use some fresh beets (expecting a slight change in taste) but if you’ve used them to make some feta and beets mini tarts with yogurt – olive oil easy crust or this winter vegetables sauce for pasta, then you probably have some leftover leaves and stems. And if you’re like me and don’t throw away food, then you’re searching for ways to use them. 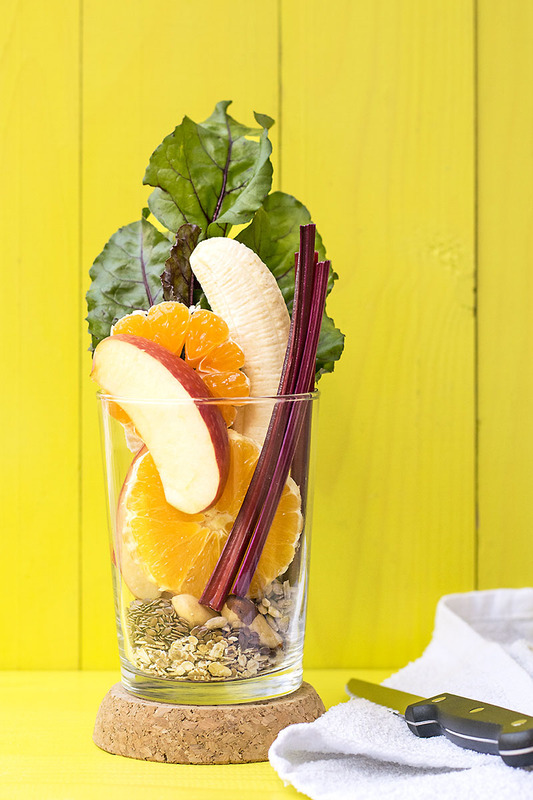 This detox smoothie is the best way I’ve found so far! Beet greens are actually the most nutrient-rich part of the plant. They’re an excellent source of fiber, carotenoids, phytonutrients, and antioxidants. They also stimulate the production of glutathione, an antioxidant that binds to toxins! Oranges have significant antioxidant properties, mostly because of vitamin C which is a powerful antioxidant which helps our body fight the damage to its DNA and RNA done by free radicals. They’re also full of soluble fiber and potassium, an electrolyte good for our heart! Bananas not only add creaminess, sweetness and great taste but they’ve also been found to help overcome depression due to high levels of tryptophan, which is converted into serotonin. In other words, they make us happier (and happy people = healthy people!) They also aid digestion and contain many antioxidants. Apples contain pectin (a soluble fiber which helps prevent plaque buildup in blood vessels) and cellulose (an insoluble fiber which helps the digestive system move waste quickly through the intestinal tract). Flax seeds provide extra fiber and omega-3. Spices like ginger and cinnamon not only add deliciousness, but they’re also used in many detox diets because they contain lots of anti-inflammatory ingredients, many antioxidants and they help to regulate our blood sugar levels. If you’re searching for some new extra healthy recipes to make this year, you can check the extra healthy category 🙂 And remember! Drinking enough water and keeping your body hydrated, staying away from processed foods, reducing animal products and eating lots of fresh vegetables and fruits will help to detoxify your body faster. Blend all the ingredients in a high-power blender for at least 2-3 minutes or until smooth (start with 2 cups orange juice). Adjust the thickness by adding extra orange juice or water. 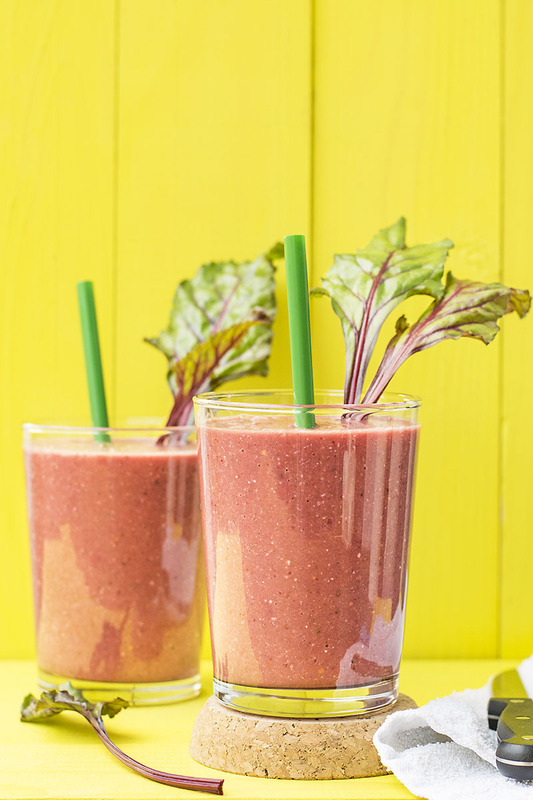 i normally saute leftover beet greens, but i love the sound of using them in a smoothie! and happy that there’s a banana – some smoothies have no sweetness whatsoever, which is too intense for me lol. Banana is always a plus, for sweetness but also for creaminess! 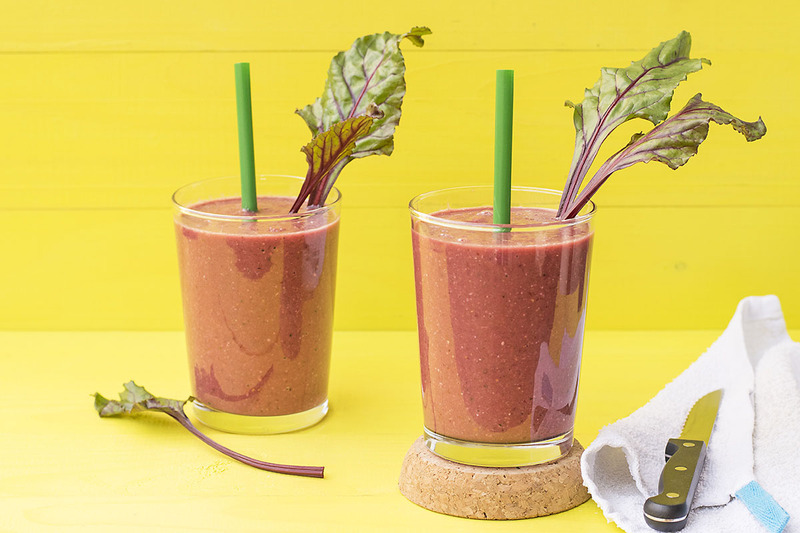 Stumbled upon this recipe on Pinterest and thought what a cute presentation… love the beet leaves inserted into a glass of smoothie! ? Every time I shop beet-root, I try to avoid the stems and leaves because I donno how to use it. Now I have a recipe… Looks Amazing Makos! I had the same problem until I realized you can eat the leaves and stems! Thank you Akhilla!